We are so anxious to see what the nesting season will bring! 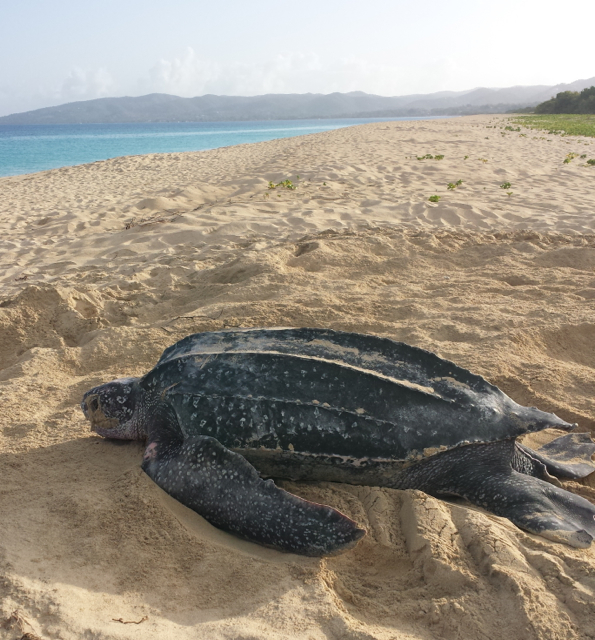 Tomorrow is February, and often if it’s going to be a busy season, our first nesting leatherback will show up at Sandy Point National Wildlife Refuge toward the end of the month. The first few nests will give us an idea of what to expect for the season. The last two years have had disappointingly low numbers of nesting females, so low that it has us worried about where they might be. Sometimes the nesting cycle (foraging long enough to get the energy to migrate and nest) takes longer than expected. Leatherbacks in the Atlantic used to nest every two to three years, but changing ocean conditions and fewer or less dense jellyfish might mean that they would take four or five years to come back. The busiest season ever was in 2009, when 203 turtles nested at Sandy Point. What a crazy season! There were up to twenty turtles on the beach on many nights! Some of the turtles that nested that year are the ones that we are waiting for – they’ve been gone now for nine years. Only time and patience will tell what happens this year but when we see the first fresh track, we’ll still be jumping with excitement! Please like our Facebook page to follow our updates and learn how to get involved with us! The distinct track and large disturbed area means only one thing – a leatherback has visited during the night!